Unless otherwise noted, all materials, including images, designs, icons, photographs, written and other materials that are part of the sussmanshank.com Web site are the proprietary property of Sussman Shank LLP or its licensors and are protected by U.S. copyright laws. You are granted a limited, non-sublicensable license to access and use the website and electronically copy and print to hard copy portions of the materials posted on the website for your informational, non-commercial and personal use only. Such license is subject to these Conditions of Use and does not include: (a) any resale or commercial use of the website or materials therein; (b) the distribution, public performance or public display of any website content; (c) modifying or otherwise making any derivative uses of the website or any portion thereof; (d) use of any data mining, robots or similar data gathering or extraction methods; (e) downloading (other than the page caching) of any portion of the website or any information contained therein, except as expressly permitted in these Conditions of Use; or (f) any use of the website other than for its intended purpose. 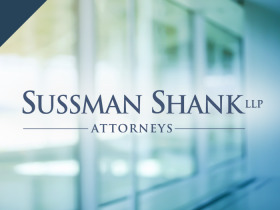 Any use of the website other than as specifically authorized herein, without the prior written permission of Sussman Shank LLP, is strictly prohibited and will terminate the license granted herein. Such unauthorized use may also violate applicable laws including without limitation copyright and trademark laws and applicable communications regulations and statutes. Unless explicitly stated herein, nothing in these Conditions of Use shall be construed as conferring any license to intellectual property rights, whether by estoppel, implication or otherwise. This license is revocable at any time. In accordance with the Digital Millennium Copyright Act ("DMCA") and other applicable law, Sussman Shank LLP has adopted a policy of terminating, in appropriate circumstances and at Sussman Shank LLP’s sole discretion, subscribers or account holders who are deemed to be repeat infringers. Sussman Shank LLP may also at its sole discretion limit access to the website and/or terminate the accounts of any users who infringe any intellectual property rights of others, whether or not there is any repeat infringement. If you believe that anything on the website infringes upon any copyright that you own or control you may file a notification of such infringement with our Designated Agent as set forth below. SUSSMAN SHANK LLP, the Sussman Shank LLP logo, and any other product or service name or slogan contained in the website are trademarks of Sussman Shank LLP and its suppliers or licensors, and may not be copied, imitated or used, in whole or in part, without the prior written permission of Sussman Shank LLP or the applicable trademark holder. You may not use any metatags or any other "hidden text" utilizing "Sussman Shank LLP" or any other name, trademark or product or service name of Sussman Shank LLP without our prior written permission. In addition, the look and feel of the website, including all page headers, custom graphics, button icons and scripts, is the service mark, trademark and/or trade dress of Sussman Shank LLP and may not be copied, imitated or used, in whole or in part, without our prior written permission. All other trademarks, registered trademarks, product names and company names or logos mentioned in the website are the property of their respective owners. Reference to any products, services, processes or other information, by trade name, trademark, manufacturer, supplier or otherwise does not constitute or imply endorsement, sponsorship or recommendation thereof by us. You are granted a limited, non-exclusive right to create a text hyperlink to the website for noncommercial purposes, provided such link does not portray Sussman Shank LLP or any of its services in a false, misleading, derogatory or otherwise defamatory manner and provided further that the linking site does not contain any adult or illegal material or any material that is offensive, harassing or otherwise objectionable. This limited right may be revoked at any time. You may not use a Sussman Shank LLP logo or other proprietary graphic of Sussman Shank LLP to link to this website without the express written permission of Sussman Shank LLP. Further, you may not use, frame or utilize framing techniques to enclose any Sussman Shank LLP trademark, logo or other proprietary information, including the images found at the website, the content of any text or the layout/design of any page or form contained on a page on the website without Sussman Shank LLP’s express written consent. Except as noted above, you are not conveyed any right or license by implication, estoppel or otherwise in or under any patent, trademark, copyright or proprietary right of Sussman Shank LLP or any third party. Sussman Shank LLP makes no claim or representation regarding, and accepts no responsibility for, the quality, content, nature or reliability of third-party websites accessible by hyperlink from the website, or websites linking to the Sites. Such sites are not under the control of LLP Shank and Sussman Shank LLP is not responsible for the contents of any linked site or any link contained in a linked site, or any review, changes or updates to such sites. Sussman Shank LLP provides these links to you only as a convenience, and the inclusion of any link does not imply affiliation, endorsement or adoption by Sussman Shank LLP of any site or any information contained therein. When you leave the website, you should be aware that our terms and policies no longer govern. You should review the applicable terms and policies, including privacy and data gathering practices, of any site to which you navigate from the website. You agree to defend, indemnify and hold harmless Sussman Shank LLP, its independent contractors, service providers and consultants, and their respective directors, employees and agents, from and against any claims, damages, costs, liabilities and expenses (including, but not limited to, reasonable attorneys’ fees) arising out of or related to any User Content you post, store, or otherwise transmit on or through the website – including without limitation any actual or threatened suit, demand or claim made against Sussman Shank LLP and/or its independent contractors, service providers, employees, directors or consultants – which arise out of or relate your violation of these Conditions of Use or your violation of the rights of any third party while using this website. These Conditions of Use and you use of the website shall be governed by, and construed in accordance with, the laws of the State of Oregon, applicable to agreements made and to be entirely performed within the State of Oregon, without resort to its conflict of law provisions. You agree that any action at law or in equity arising out of or relating to these Conditions of Use or your use of the website shall be filed only in the state and federal courts located in Multnomah County, Oregon, and you hereby irrevocably and unconditionally consent and submit to the exclusive jurisdiction of such courts over any suit, action or proceeding arising out of these Conditions of Use or your use of the website. If any portion of these Conditions of Use shall be deemed unlawful, void, or for any reason unenforceable, then that provision shall be severable from these Conditions of Use and shall not affect the validity and enforceability of any remaining provisions.